There are 3 main industries that support Wagga: agriculture, education, and the military are the biggest employers, and the role of that 3rd one is going to be much more prominent this week as Australia celebrates ANZAC Day. 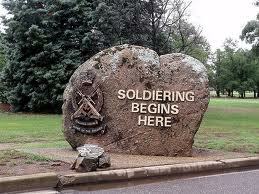 This rock at the entrance to the Blamey Barracks (more commonly known here as Kapooka) is the precise point where new recruits at the Wagga-based army training facility become soldiers. ANZAC Day commemorates an event in 1915 that saw the Australian and New Zealand Army Corps enter World War I with the Allied Forces, the April 25 landing at Gallipoli that ended up being a bit of a blood bath. Over the course of the campaign, an estimated 120,000 soldiers were killed, and while the majority of them were Turks and Brits, about 8700 Australians and 2700 New Zealanders died. Another 35,000 or so diggers were wounded in battle. Proportionally, compared to the countries’ populations at the time, this was quite high. Gallipoli is also quite relevant to Australian military and political history because of the isolation of Australia – this was the first international military campaign they were involved in, proudly going in support of the British Empire. However, given the mismanagement of the campaign by the British, Australian confidence in the superiority of the British Empire took a huge hit. 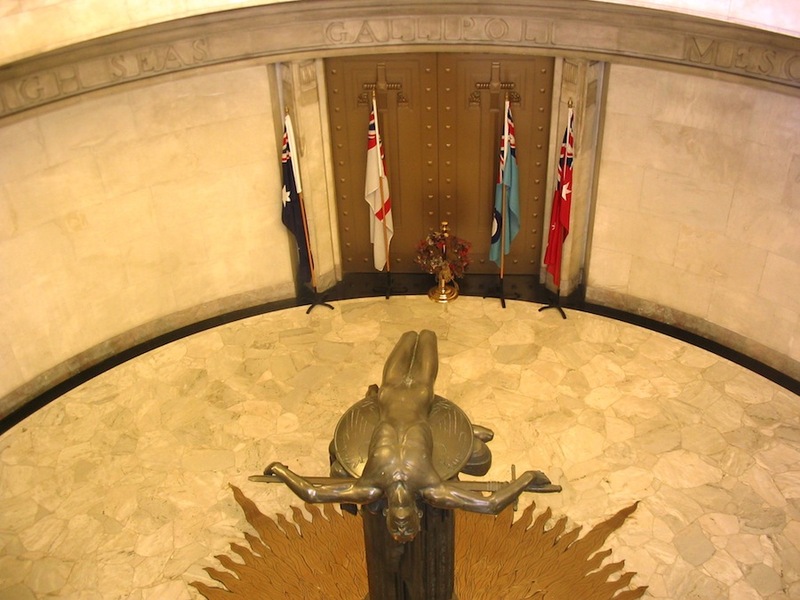 The ANZAC memorial in Sydney's Hyde Park is a pretty spectacular place. So while there is recognition of Armistice/Remembrance Day here, like there was in Canada, ANZAC Day is the bigger day for honouring the military. In Wagga, there will be a dawn service (at 6am, to mark the time of the landing at Gallipoli), followed by a ‘pilgrimage’ to the War Cemetary (just down the street from us). After that, there is a parade and another service at the Victory Memorial Gardens. We will probably go to the parade, just to see what it is like, and stick around for the service after it. Doubtful we will make it to the early morning one though. We didn’t ever go to the Remembrance Day services in Canada, even though Dan’s dad served in Europe and was a long-standing member of the Royal Canadian Legion and participated every year in the service. Remembrance Day didn’t seem to have the popularity that ANZAC Day does here. In Canada, most people worked on Remembrance Day; in most provinces it wasn’t even a school holiday any more. But in Australia, ANZAC Day is taken seriously. There is no school, no government offices are open, stores aren’t even allowed to open until after lunch. It might be that Gallipoli and the ANZACs have remained in popular culture here better than World War I in Canada: people eat (either commercial or home-made) ANZAC biscuits, cookies that are similar to what was sent to overseas troops in WWI. There is the movie about Gallipoli with Mel Gibson (probably all that most Canadians know about that battle). And one of Australia’s best known folk singers wrote a very good and popular song about the aftermath. And while it might seem a bit sacrilegious to post a British/Irish version of it here, this is a) one of our favorite bands; b) this version is one of Dan’s favorite songs; and c) Bogle was actually born in Scotland so the Pogues are almost as Australian as he is. This is a pretty sad song (warning: really sad…) but maybe if there was something this powerful from a Canadian perspective, more Canadians would keep the sacrifices made by Canadian soldiers and their families a little bit more in the forefront of their minds. And as a disclaimer, we in no way know how accurate our description of Gallipoli or ANZAC Day is. Much of it was from wikipedia. This entry was posted in ANZAC Day, holidays, military. Bookmark the permalink. 4 Responses to what are they marching for? Yes Elizabeth maybe the saner thing to do is sometimes let traditions like Anzac day die off rather than evolve to the pint that they become just another day for people to celebrate a day off work rather than one when they actually think about why they are off that day. Last year we witnessed the ANZAC Day parade in Sydney. Really spectacular- both in pomp and emotion – and we both wished that Remembrance Day was held in similar esteem. We also witnessed the tradition of post-parade drinking and two-up too! Got the song on a cd when I was in Oz and it always makes me cry. Surely one doesn’t wish one a “happy” ANZAC day?